I think the hardest part of a project like this – one in which people from all around the world contribute blocks – is in the gathering of information. I still don’t have names for many of the blocks that were submitted, though we have determined the maker of each block. 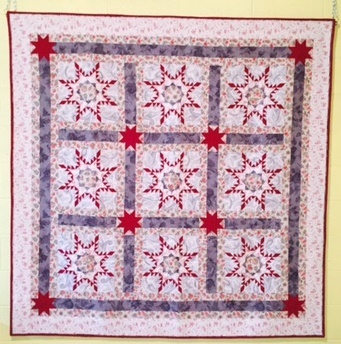 Photos are being taken as I finish quilting each block, and while the block is still in my quilting hoop. At times, it’s difficult to photograph the block so it comes out square. All blocks ARE square in the quilt, but the photo sometimes skews the photo. It is especially difficult to photograph when there is a heavy weight on part of the quilt that will not move. you are moving right along on this quilt – I have put off quilting Dear Jane II for sometime now – it is a challenge for sure with all those seams, I am not sure how I will go about quilting it when I get around to it. The blocks are fantastic.Last month I put off my DJ but hope to catch it again. Love seeing the progress, Caron. The quilt is beautiful. And your inspector looks like she's doing a great job testing the quilt:) Thanks for all your hard work.